If you’ve always dreamed of more beautiful eyelashes, Gentle Touch MediSpa in the Orlando, Florida area has the solution for you. 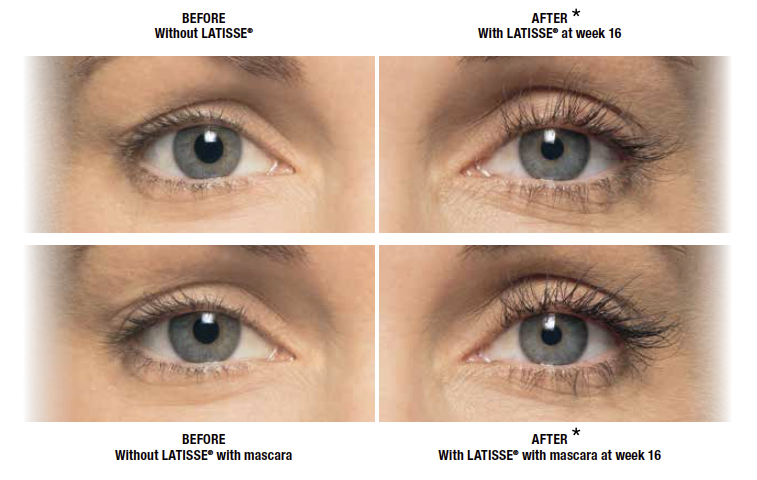 Latisse® is the safe and effective prescription solution for thicker, longer, and darker lashes. After 16 weeks, you’ll be amazed at how wonderful your lashes look! After just a few months of regular application of Latisse®, you can expect a total turnaround in your lashes. They’ll look lusher, fuller, and darker, helping to enhance your total look. To see the best results from Latisse, you should apply it to the lash line of your upper eyelid only every night for 16 weeks. Be sure to remove your eye makeup and contact lenses before use. In as little as 8 weeks, you may already begin to see a positive change in your lashes. Side effects of Latisse can include eye redness or itching, dry eyes and eye irritation, and darkening of the eyelid skin. These side effects are uncommon, though if you do experience any, they will subside after you discontinue use of Latisse. After 16 weeks, we’re sure you’ll be so pleased with your results from Latisse that you’ll want to see us again about the benefits of continued treatment. Getting older brings its share of nuances such as thinning eyelashes. Started using Latisse about 6 months ago and now I can't stop. The product's results together with economical pricing at Gentle Touch makes me a steady customer. I love Lorriel and her expertise in the esthetic field! Thank you for everything and for making me beautiful! The care is excellent! Felt like a princess from the moment I arrived! They explained everything and answered all my questions. We made a plan together. Highly recommend! I can't say enough good things about my experience with this spa. This was my first time and experience getting a derm filler and I was super nervous. Lorelle was fantastic! She was so patient with me, answered all my questions, and made me feel really comfortable. I was not pressured in any way if I was not ready. Also, what was really nice was there was no "up sell" or pressure to buy products like some spas. I will definitely be a regular customer. I really enjoyed my experience there. HOW LONG DOES LATISSE TAKE? Latisse allows you to have the eyelashes you wish you were born with. If you’ve been dealing with thin, light, or short lashes, Latisse will turn them around. You’ll no longer need to apply multiple coats of mascara to achieve incredible-looking eyes. Latisse takes about 16 weeks of daily use for you to see beautiful results. If you stop using Latisse, your eyelashes will gradually return to their natural state. Other lash products do not require a prescription. Only Latisse has been approved by the FDA as a prescription treatment to grow lashes fuller, thicker and darker. Latisse has been studied in clinical trials for safety and and effectiveness. Have you been wanting lusher lashes to enhance your natural beauty? Our knowledgeable staff at Gentle Touch MediSpa & Wellness would be happy to discuss how Latisse can benefit you! Set up a free consultation today at our Ocoee, Florida medspa by calling (407) 877-7003 or use our online request form.